Almost wordless: I usually see Goldenrod in the prairie in large numbers creating waves of bright yellow. These two plants were in the woods, and I liked the way a small shaft of morning light illuminated them. How can something so pretty cause so much sneezing? That was my thought exactly! Achoo!!! Sneezing for me too. And scratchy eyes. This was my first walk in the prairie in several weeks and I’m still suffering for it two days later! The main bloom in my wildflower garden! Same here. And swollen, scratchy eyes. It seems like it gets worse every year! My daughter was just saying how pretty she thinks goldenrod is. This picture totally proves her point. 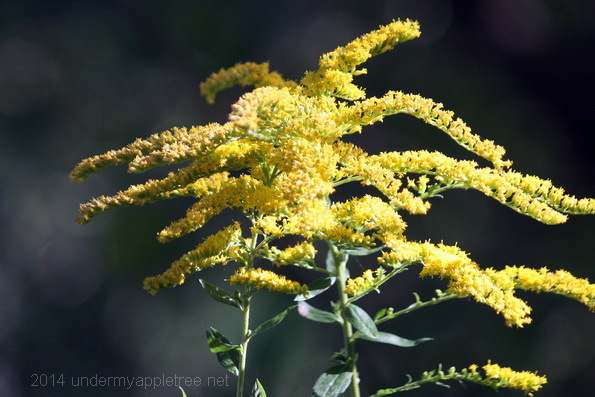 A bit of trivia: it’s not goldenrod that affects allergies, it’s ragweed. They bloom at the same time and goldennrod’s pollen falls to the ground while ragweed pollen (a shorter plant) rises and *floats* — and that’s what makes us sneeze. But because it’s the tall wands of goldenrod we see, so we blame IT. Doncha love it even more now?? Ragweed is definitely a problem for me. Good to know I can stop blaming the Goldenrod now. An aside – the female Cottonwood tree gets all the allergy blame too because she drops the fuzzy bits, but it’s really the male and his invisible pollen that causes all the trouble. I know, because I have a male tree in my yard!